If the liberation of Khorramshahr, 20 years ago, brought tears of joy and pride for us, pictures of Khorramshahr, 20 years on, bring us tears of sadness and regret. Worse still when the mayor of Tehran, talks about rebuilding Beirut and forgets that charity should begin from home, its like he puts salt on the wounds of the citizens of Khorramshahr and those whose courage and sacrifices liberated Khorramshahr from Saddam's aggressors. That's the legacy of the Islamic regime. 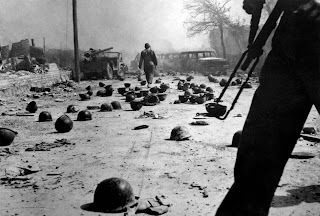 Khoramshahr was liberated by the men and women raised and trained by the Shah's government. The Islamonazis have brought us nothing but sadness and misery. Did you expect anything else from the TAZI PARESTAN a.g Bar man kid? Hezbollahi in what sense? The Lebanese Hezbollah or the Iranians who were loyal to Khomeini at the time?